Great “call to action” – and super great gator shots! The camouflage of a baby gator can only be appreciated close up. They are hard to see even when you are right on top of them! That big ole gator sunning himself (herself?) on the bank plays a VERY important role in the life of the bird population. They patrol the moats that surround the tree islands used by the birds for nesting. River otters, raccoons and other predators will still try to cross onto the islands – but one look at that goofy, toothy grin tells you that there is some risk involved. One look at that fat ole belly also lets you know that the gator wins frequently. Without the gators standing guard, there would be far fewer bird families thriving in the swamp! Beauty indeed. In the eye of the beholder — and the be-knower. Knowledge is power. Those baby gators’ camouflage ALWAYS amazes me. Their stripes blend perfectly with the aquatic vegetation root systems. Try finding them in the water amid the roots — fail! And if we didn’t have our gators… WOW. People always think they eat all the birds. Nope. You explain it perfectly. We just need to protect more of these islands, eh? I loved this guy…. What was so interesting was that there were 3 together (odd! ), and they had all just eaten. NOT to be bothered! No worries. 🙂 He was a big boy. Whoo. Not to be bothered – but definitely not aggressive or ill-tempered. More like fat, dumb and happy. He actually looks a lot like the gator a saw guarding the rookery at SWA. Goofy factoid: more people are killed every year by deer attacks than by ALL alligator attacks since WWII (18 alligator attack deaths total, versus approx 20 fatal deer attacks per year). You’ve been warned: Beware of Bambi! They demonize certain wildlife so easily… But look no further than the 2-legged variety if you want to do that. And… You are completely dead-on. This guy IS at the rookery/SWA! I just said Everglades for brevity. He was in a group of three, which was unusual — but he was off a bit on his own. Quite the big boy. And VERY content. Heh heh … I’d recognize that mug anywhere! As an aside, I took your Limpkin challenge yesterday, and bagged me a few good shots. Check out my profile for the two new Limpkin shots. Even better (and tying this into Audubon) – I took these shots in a major metro-park (John Prince); not a wilderness area. While there, I also visited with a dozen Wood Storks, two Black-Crowned Night Herons, a Green Heron, a plethora of Pelicans, a few Osprey and the usual gang of egrets and herons. That biodiversity was made possible because the county and the Audubon Society took the area around Square Lake and restored the wetlands habitat. Those few acres made all the difference – the south side of John Prince Park only trails Wakodahatchee and Green Cay for wading birds. I’ve heard about this venture… Many others have made the suggestion to visit, raving about the biodiversity. A big YAY to Audubon for creating this space in the middle of an urban environment for the native wildlife! Can you believe I have yet to visit? Sigh. When I return from the holidays… A MUST. It’s not far from my home, so I have absolutely no excuse. GREAT example that you provide…. PERFECTION! Going now to see your Limpkins!!! Isn’t he wonderful? He had just eaten…and was in no mood to be hassled with. Not that I would want to try. He was a big boy. Great post! This reminds me that so many of my best spiritual experiences have come in the wilderness. Mine have come mostly in northern forests and mountain-tops, based on where I’ve been. Your blog gives me a beautiful taste of the Everglades! I have certainty that when I get to experience them in person, they’ll light up my soul and bring smiles to my face! So wonderful…. I’m thrilled that I’m able to bring this area’s beauty to life. It really does need as many voices as possible — to contend with the greedy developers and unknowing citizens, unaware of what surrounds them. I too have had my most magical moments in the wilderness. The purity of Nature, the beauty, the simplicity…. So many reminders of what we should strive for in our physical and spiritual lives. The flora and fauna are amazing examples of these reminders…. The light filter through the feathers and the gator from the front are wonderful shots. Thanks so much! I was lucky to catch the breeding egret in the setting sun — perfect timing. 🙂 And I fell in love with that toothy gator. He had obviously just eaten, and was in no mood to be bothered! Nice toothy grin on the big boy too. Glad there is this protected area for the wildlife. I really need to catch up on my baby gator images… So many! Adorable babies, love them! Beautiful Captures – love the last one – sorta like he is saying go ahead and make my day or take my picture:) Happy Friday! Hee, so true! When I saw him, I fell in love. He had obviously just eaten, and was sunning himself — was in NO mood to be bothered. That face! Love it! Good reminder for us to support these organizations that are doing such great work! Thanks! As much as I’m out in these natural spaces…daily, weekly…I fail to regularly visit their wonderful resources! There’s so much to tap into. 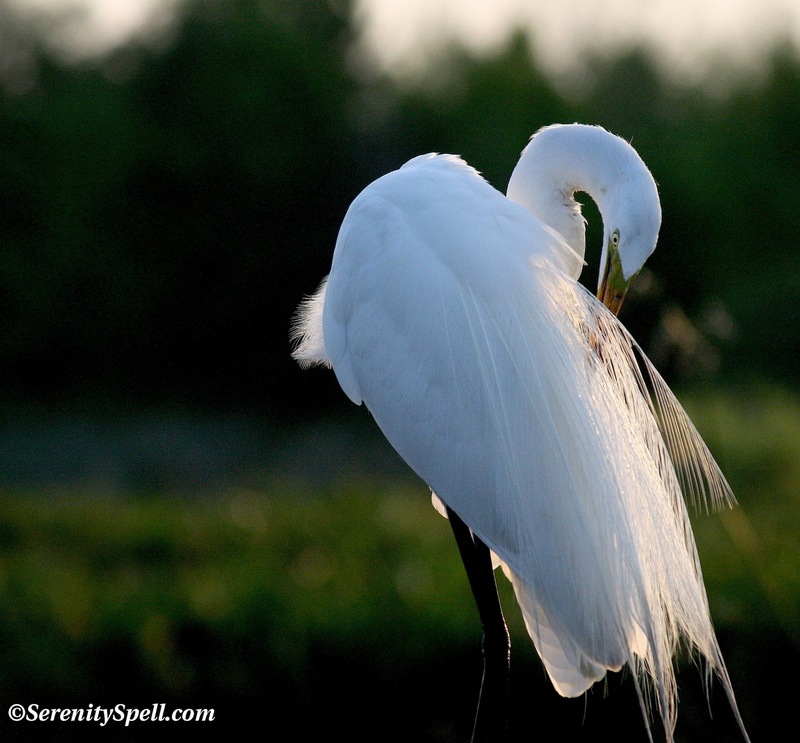 I like the detail and the light in the egret image. Thanks — it was a perfect time, with the setting sun. Just right! OH that last gator is totally looking at you saying…Heeeyyyy What you doin? Hahahaha! He’s saying, Whasssup, sassy? Got some chicken? No? Then stop bothering me. That’s so wonderful… I wish I was exposed to something like that (I was raised overseas, so we had our own Nature-exposure — quite immediate-like, hahah!). I hope the funds keep flowing, to allow such programs. We need to continue to instill this love and respect of the Natural Kingdom in children. Amazing light on the egret! And that gator was smiling for the camera! Great shot of alligator sunning – looks like you got right up close and personal!! Thank you – always enjoy your blog!!! mmmmm -and what did he eat??? Whooo-boy!!! A birdie that wasn’t paying attention?!?!? Thank you for a really nice post! We all need to shout this message from all corners of our world or else it’s doomed for our grandchildren. I love being “out there” as much as possible and it’s easy to take our beautiful planet for granted. It’s definitely very personal when you’re at the edge of a swamp at that magic time when the sky begins to lighten just before the sun rises and you experience Nature starting a New Day. Thank you for a really good post and a message which we should all be shouting from all corners of our world. I know I take it all for granted, but through efforts such as yours perhaps we can learn to pause once in awhile to appreciate Nature’s beauty all around us and become a bit more determined to do our part to save it for our grandchildren. You’re so kind, thanks very much! You do the same with your beautiful blog and images — showing the area’s beauty, its most wondrous inhabitants… Bit by bit, this is how we can help, I believe. Thank you for highlighting your local Audubon Chapter. While many people believe that Audubon is only concerned with birds, I know that isn’t the case. I too am a huge fan of my local chapter – Audubon of Portland. Here, they lead the conservation community fighting for wildlife and habitat in our metropolitan area and beyond. They’re willing to take a stand where others aren’t, they have an amazing dedicated and hard-working staff, and I know without them the livability of Portland would decline. Thanks so much — there are many resources they provide to assist the local population, I honestly had no idea. And while there are many groups doing their best to work against the wayward surge of development that must be stopped — or at least reined in — in our area, Audubon is very organized. I hope that much can be done in the near future to protect MORE land for these birds and other wildlife. I agree, and will add, that it’s important to save those places for the sake of our well-being too. I know you get that, just had to put it into writing. There are so many reasons to value wildlife and quality habitat, but not so many groups that understand those reasons, including knowing that development isn’t always in our best interest. My local Audubon seems to get that, sounds like yours does too. Thanks again for posting and raising awareness of their work. Oh, MOST definitely. Most absolutely. Without these places, well… To say that we’d be lost as a species, is putting it mildly. There are so many facets to saving the land and the critters. Audubon is a marvelous organization. One of its great strengths is the local structure that allows different groups to address different needs. Very NICE! I had no idea… I’m going there now. Although, my funds may be a tad short this holiday — recently single, and last night a starving black kitten crossed my path. What’s a girl to do…? Honestly. So very wonderful… If more people did the same. But I have hope — I think more are!! Awareness, respect, and general caring must be growing. Thank you so much for visiting our blog and allowing us, in turn, to discover yours. Such amazing bird and wildlife photography – you can certainly be proud of your work. We will definitely be back for more. You’re so very kind, many thanks! I was so happy to have discovered your beautiful work (via another Florida hiker and photog) — just lovely. Hi just began reading your blog and love the content and photos! I saw your link on Florida Adventurer and you replied to one of my guest posts. But I love these alligator photos, so beautiful! Many people fear them and rightfully so but I embrace all of Florida’s nature and animal life. I adore gators…. And while they are magnificent creatures, definitely to be respected — they are NOT the monsters many try to make them out to be. They are actually quite mellow. As an avid hiker, of the hundreds (thousands?) I’ve seen, none have been aggressive. One just has to be aware of the nesting and breeding behaviors and seasons, because they ARE wildlife. Kudos to people who act as earth stewards. Love your photos too because that’s another way of waking people up to walk more lightly on the earth.